Reducing China's exposure to foreign currencies by increasing the use of the renminbi could limit the risks for Chinese traders, investors, and financial institutions, but major hurdles lie ahead. "How much is that in renminbi?" is a question that could increasingly arise in future international transactions. At least that's what China's recent moves appear to target. Standard & Poor's Ratings Services believes that an increased awareness of foreign exchange risks among China's policymakers is one reason for Beijing's push to internationalise the country's currency. But despite the greater political willingness in China to see it through, major obstacles stand in the way of widespread international use of the Chinese currency. We therefore believe the renminbi is unlikely to feature prominently as a currency for international exchange for a considerable time. At the moment, the Chinese currency is conspicuously absent in international trade or financial transactions. Yet the International Monetary Fund forecasts that China will overtake Japan to become the world's second-largest economy in 2010. Unlike the currencies of other major economies -- the US dollar, the euro, or the yen -- the renminbi is rarely used beyond China's borders. In fact, the currencies of several markedly smaller economies, including those of Australia, Switzerland, and the UK, are more commonly exchanged internationally (see chart 1). China's approach to financial and monetary policies partly explains the limited international use of the renminbi. The Asian financial crisis of 1997-1998 shaped the cautious attitude of Chinese policymakers toward liberalising the financial sector. Although the country has thrown its doors wide open to international trade and direct investment, strict capital controls ensure that its currency is used almost entirely for domestic transactions. Only a small amount of its external trade -- mainly with neighbours such as Laos, Myanmar, North Korea, and Vietnam -- is denominated in the Chinese currency. That said, the volatility in the international financial markets in the past two years has not had the impact that some would have expected. Instead of reining back further financial liberalisation, China has announced measures to deepen the development of its domestic bond market, such as easing restrictions on the sale of papers in the interbank market and possibly allowing foreign companies to sell renminbi bonds, and to ease cross-border financial investments. In our view, these moves are likely to be at least partly related to the push to expand the international role of the Chinese currency. The Chinese government has recently made serious moves toward internationalising the renminbi, several years after the idea first came under public discussion. Since late 2008, the People's Bank of China has signed bilateral currency swap agreements with other central banks in countries that include Argentina and South Korea. The facilities could provide renminbi for use in bilateral trade in such countries. In April 2009, the Chinese government announced that it would allow renminbi settlement for specific cross-border trading activities in five coastal cities on a pilot basis. China has also broadened its experiment to build a renminbi financial system in Hong Kong. As part of the pilot trial of cross-border trade settlement, banks in Hong Kong have been allowed to expand their renminbi commercial banking activities to facilitate trade settlement. The Chinese government has also expanded the list of institutions allowed to issue renminbi bonds in Hong Kong to include the mainland subsidiaries of Hong Kong banks. Previously, only mainland banks were allowed this fund-raising option. In September 2009, the Chinese government itself sold renminbi bonds in Hong Kong for the first time. The impetus for China's decision to begin the process of renminbi internationalisation despite the severe global financial volatility, in our opinion, was increased concerns over exchange rate risks. A number of governments that issue in internationally used currencies are projecting sharply higher debt levels in the next few years. The risk that large currency depreciations or high inflation in these countries could erode Chinese holdings of foreign currency assets has risen as a result. In our view, reducing the foreign exchange exposure of the Chinese economy by increasing the use of the renminbi could limit the risks for Chinese traders, investors, and financial institutions. Internationalising the Chinese currency could bring other benefits to the country. Renminbi-denominated financial instruments that non-residents issue would provide Chinese savers with a greater variety of investment options while addressing the risks of currency fluctuations. Chinese bond issuers may also benefit from having access to a more diverse international investor base. The costs of financing the country's foreign exchange reserves could also decline in the long term. As more traders use the renminbi and more investors hold the currency on a long-term basis, an increasing share of the money supply will circulate outside the Chinese economy. The renminbi money supply could grow significantly more than Chinese GDP with less risk of excess liquidity sparking high inflation. The flip side is a weakening of control over domestic monetary conditions. Internationalising the renminbi means China would have to significantly ease capital controls, in our opinion. With a large pool of renminbi funds abroad, changes in domestic or international market conditions would likely cause strong capital flows. The result could markedly reduce the effectiveness of Chinese monetary or credit policy actions. Even if China believes that the benefits of currency internationalisation outweigh the costs, major hurdles lie ahead. The most important of these is that the renminbi remains non-convertible and subject to strict capital controls. The Chinese market will always be the largest and most liquid market for renminbi funds. If non-residents cannot easily buy and sell the currency and if non-resident financial flows are strictly regulated, the costs and liquidity risks of holding the renminbi would likely deter widespread international use. China's developing financial markets are largely inaccessible to non-residents, a further impediment to internationalising the currency. 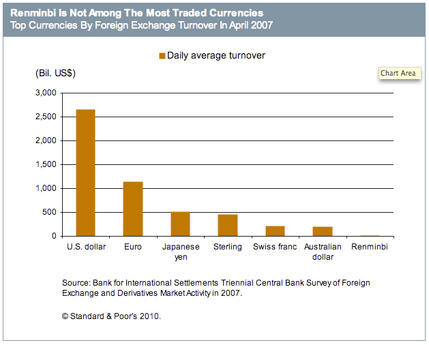 An internationalised renminbi requires non-residents to be willing to hold a large amount of the currency. If they are unable to invest these funds in liquid and relatively safe instruments that offer a reasonable rate of return, non-residents are unlikely to hold the currency. Financial derivative markets in China are also insufficiently developed for efficient and cheap hedging against foreign exchange and interest rate risks. Another issue is that many people consider the policy environment in China to be opaque and difficult to predict. International investors and traders would likely be concerned about abrupt changes that affect their interests for some time to come despite ongoing policy environment improvements. We expect this to be another factor that will deter non-residents from long-term holdings of the currency. Until these conditions improve significantly, in our view, large-scale international use of the Chinese currency won't become a reality. Yet, while the euro has strengthened its position as a key international currency in the past 10 years, it remains a distant second to the greenback. Within the European Union, the euro has become the currency of choice for cross-border trade and financing. Outside of the European Union, however, the use of the euro has either shown only small gains or even declines in the eight years to the end of 2007. 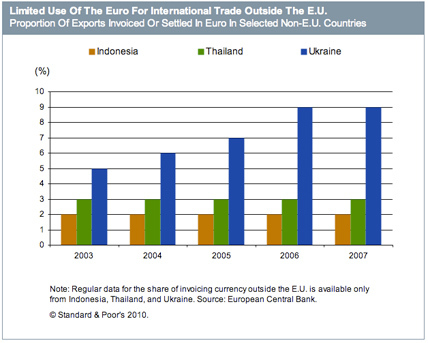 The use of the euro as an invoicing currency for merchandise trade, for instance, accounted for less than 10% of international trade outside Europe (see chart 2). Similarly, Japan's efforts to internationalise the yen from the 1980s to early 2000s had little lasting impact on the currency's international use. Despite significant liberalisation of regulations on the financial sector and capital accounts, the yen's share of cross-border merchandise and financial transactions has remained little changed over the period. China's strong economic potential and the very limited international use of the renminbi today suggest to us that its internationalisation efforts will be more successful than that of the Japanese yen. However, we do not expect international use of the Chinese currency to exceed that of the yen in the coming decade. As with other changes in China, we believe that policymakers will gradually make the requisite changes to facilitate cross-border renminbi use. International confidence in the predictability and transparency of Chinese policies will also take time to build. Thus, the day when traders need to quote renminbi prices for a significant part of their sales and purchases, especially outside East Asia, still appears a long way off. The author of this article, KimEng Tan, is a director of sovereign & international public finance ratings at Standard & Poor's.